The bay of Porto Pollo where the Village Isola dei Gabbiani is located, in Sardinia, is one of the best windsurfing spots in Europe and offers unparalleled scenery to sailing sports enthusiasts from all over the world. 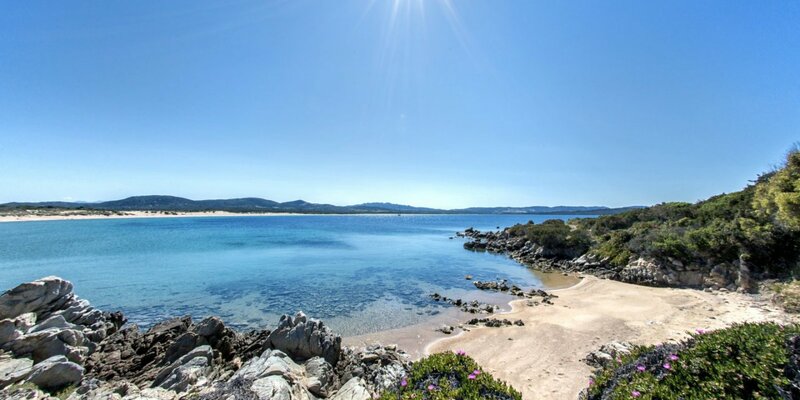 This beach a few km from Palau and Santa Teresa di Gallura is in fact known for its favourable position to be often beaten by mistral winds, as well as the entire coast in front of the archipelago of La Maddalena, offering incredible days for those who want to try their hand at surfing, windsurfing or kytesurfing. The best months for your windsurfing holiday in Porto Pollo are certainly May, June, September and October, months in which the winds go straight into the bay and the beaches are less crowded, ideal for plying the waves in total safety and freedom. The particularity of Porto Pollo is then to have 2 bays, one with sea wind ideal for the most experienced surfers and the other with wind from the ground that allows even those who are novice to try this wonderful sport. Porto Pollo is in fact also the perfect place to take windsurfing lessons with careful instructors and professionals, who will reveal the secrets of sailing and this coast so wild and unspoiled. Not far from our Village Isola dei Gabbiani, frequented all year round by groups of surfers and enthusiasts, there are numerous surf schools and centers for renting boards and various equipment. Remember also that we often publish special offers for fans of active holidays and sports, with exclusive discounts on courses and rental equipment for windsurfing, kite, sup, canoeing. Discover our best offers for summer 2019! Reaching our Village in Porto Pollo is quite simple: located on the north coast of Sardinia, is easily accessible by car from both the port or airport of Olbia, which is just over 40 km, and Alghero airport in about two hours of travel. In addition to the possibility of windsurfing in one of the windiest places in Italy, surrounded by crystal clear waters and spectacular nature, guests of the Village Isola dei Gabbiani will also have all the services of a real Holiday Village, such as bar, restaurant, entertainment and beach equipped with sun beds and umbrellas. What are you waiting for? If you are looking for a holiday between sea, sun and wind, Isola dei Gabbiani is the perfect Village in Sardinia for you and your windsurfing board!